For reasons certainly linked to its history of Spanish colonization, and perhaps to its precolonial history, feasts are an especially important element of Catholic life on Guam. 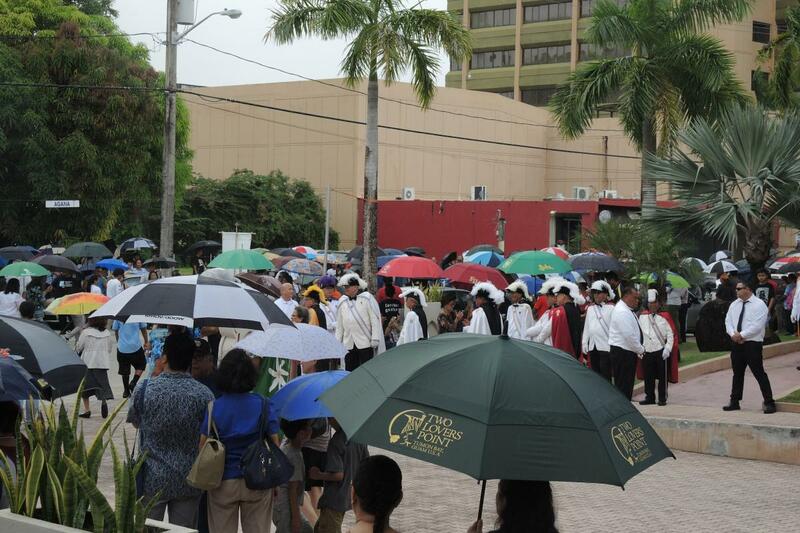 Every parish on the island celebrates its patron with an annual day that includes Mass, a procession and food. Newspapers and television announce these feasts and send out photographers, and interviewees spoken to during this research often knew when and where there was a feast coming up next. The scale and tone of these is typically modest, compared to some cultures, but a procession remains an important and meaningful ritual here. The largest of the feasts is the feast of Santa Marian Kamalen, the Patroness of the Marianas, and of the capital city of Hagåtña. She is also referred to as the Dulce Nombre, the “Sweet Name,” and the cathedral where the image is housed, above the main altar, is the Dulce Nombre de Maria Cathedral Basilica. 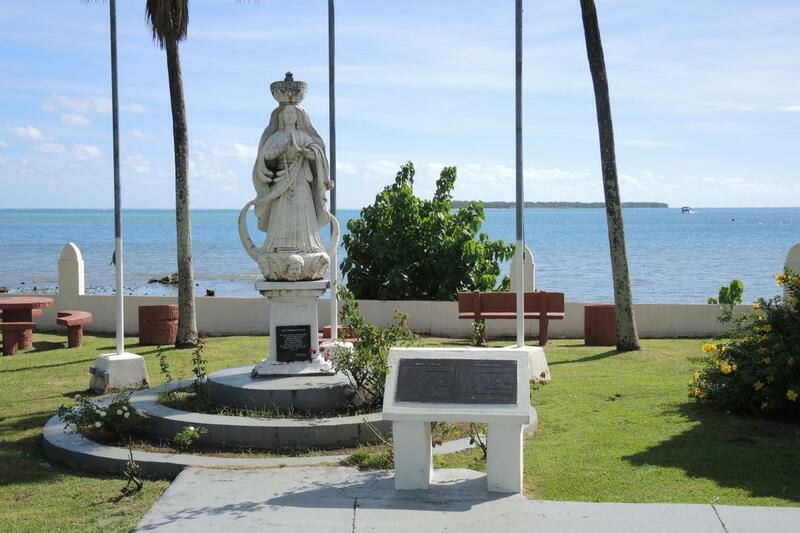 The Torres family successfully hid the statue away in the countryside during the Japanese occupation and the American war to recapture the island. “It doesn’t matter who’s in or out of office,” said another. “When a new priest comes to the cathedral, he asks us for permission” before first touching Santa Marian Kamalen. The women call themselves camareras, Spanish for maids or caregivers. In accordance with Chamorro lineage traditions, the responsibility passes from mother to daughters. In the Torres family, all the women, some of whom live in the mainland United States and Hawaii, are expected to return home annually for this if it is at all possible. A dozen women share this responsibility as their intrega, a vow that is passed down among generations. They pay for refurbishment of the statue, and for the carozza that carries it. Each woman and girl in the family has some responsibility — to clean her jewelry, or fix her hair. When the statue was stolen in 1991, and recovered under a bridge with its jewelry stolen, all the women of the family, even the teens, turned over jewelry for her. “When you honor your mother, you give her your best.” A different family’s intrega is to provide flowers. Another family coordinates the young damas, the girls dressed in costume to accompany the statue in procession. The statue of Santa Marian Kamalen is made of ivory and molave, a wood from the Philippines. As local legend recounts, it was found by a fisherman, floating in the water between Guam and Cocos Island, a tiny island a few hundred meters off the southern shore. Her story of miraculous discovery in the sea parallels a whole range of Spanish Marian devotions from the era, but even devout locals also suggested a more prosaic story, that she came from the shipwreck of the Señora del Pilar, which sunk off the coast of Cocos and had an image of the Immaculate Conception onboard.2 She was brought to the military barracks (camarin in Spanish), and became known as Our Lady of Camarin, or Kamalen in Chamorro. 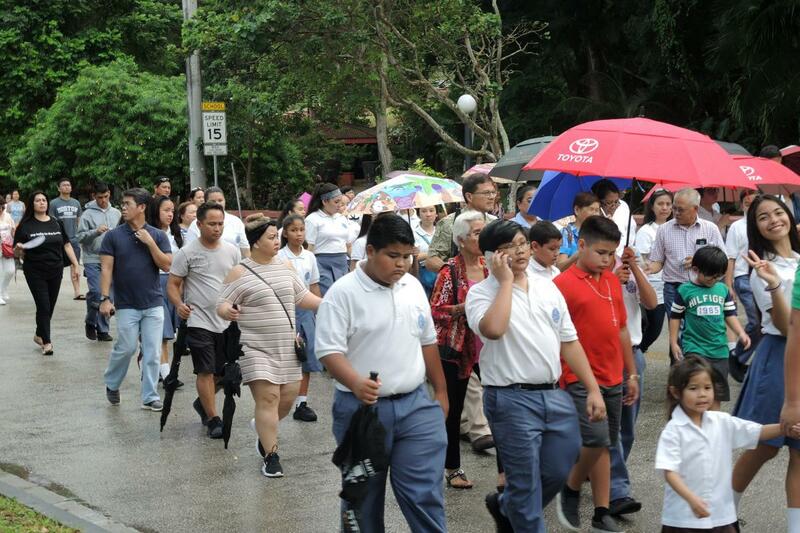 Each December 8, also the Feast of the Immaculate Conception, large crowds gather at Dulce Nombre de Maria Cathedral Basilica for Mass and a long procession to celebrate Santa Marian Kamalen. The day is a legal holiday in Guam. That morning, her statue is brought down from its alcove above the altar. No men are allowed present while the Torres women prepare the image so that it can be revered close up. 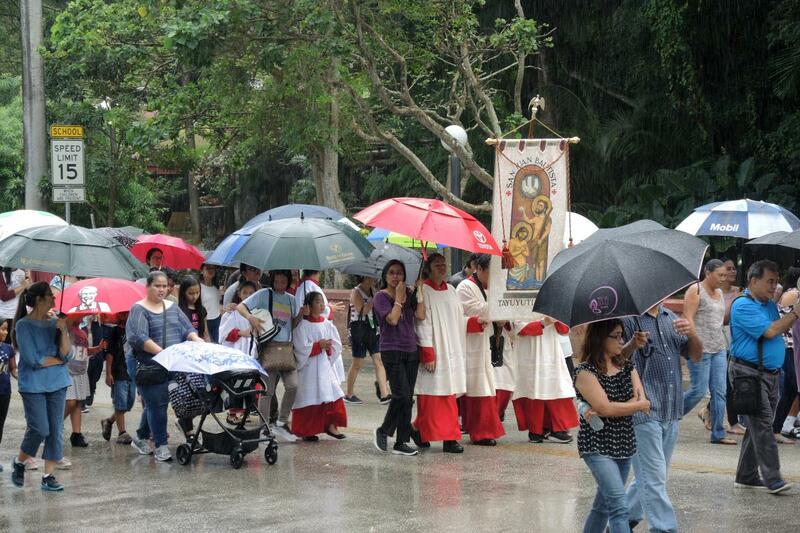 At the 2017 events, shown in video here, public celebration began with the Rosary and novena at 2 p.m., followed by a 3 p.m. Mass, and a procession in light rain for about an hour and a half. Unlike processions in many places, there was no music. Instead, women led the Rosary over loudspeakers, and some prayed with them while others walked and talked quietly. 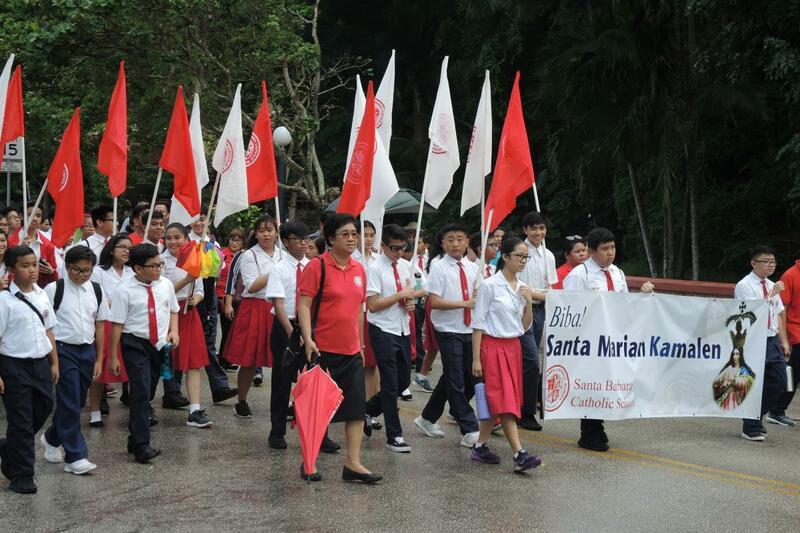 Many of the island’s parishes and schools processed as groups behind a parish or school banner. The procession traveled around the perimeter of the area known as the Plaza de España, site of Spanish colonial rule. Today the area includes not only the cathedral (on land given by the Chief of Hagåtña in the era of first contact) but also Guam’s legislature and judiciary building. After the procession, the statue of Santa Marian Kamalen remained accessible near the altar, until it was returned on high at night. Even as interviewees pointed to the importance of local parish feasts as an important facet of Chamorro religious culture, some were aware that they had changed. In the past, they recalled, every family would have an open house feast afterwards, and people could go from one house to another, sharing in the food and making it more of a village event. Today, they say, after Masses and processions, it’s more a matter of individual feasts and invited family or friends. Indeed, after the big feast of Santa Marian Kamalen, people who had come from across the island typically returned to their own family dinners, or went out to eat. 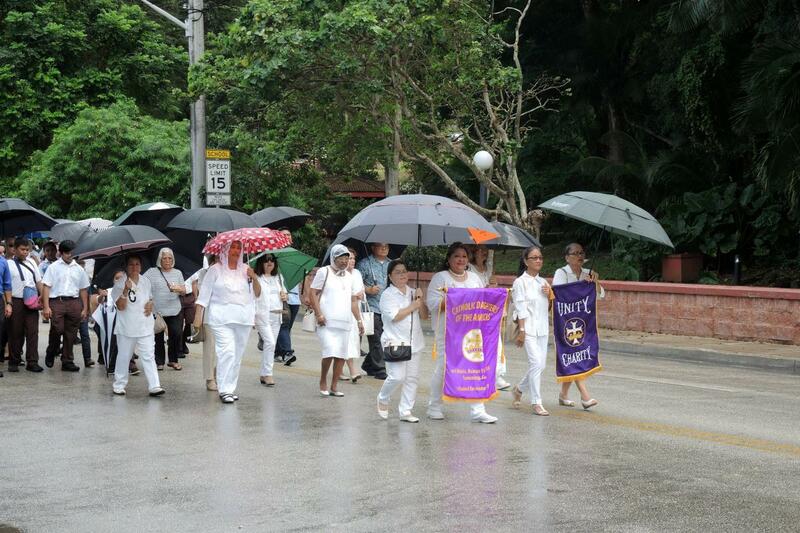 Corpus Christi is also marked with processions in many parishes, giving neighbors a chance to participate and bring solemnity of the occasion to their homes. In one parish, interviewees described their procession: it travels around the neighborhood and stops at three houses, each chosen in advance. 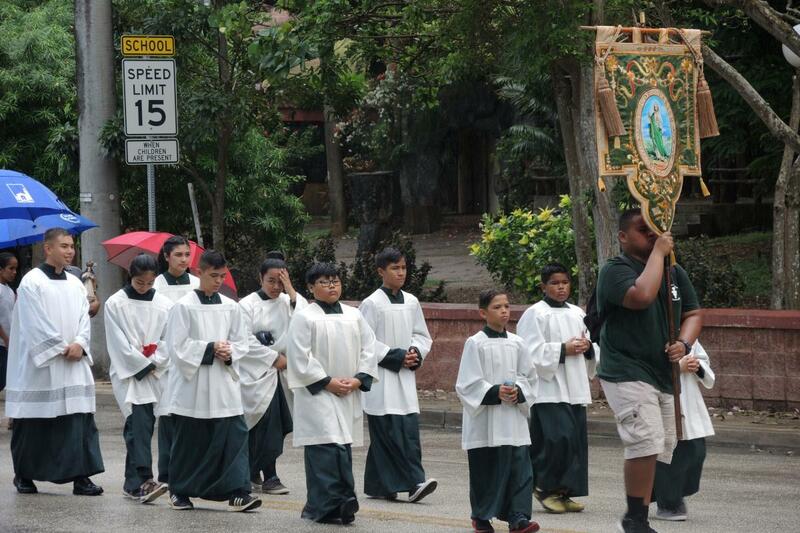 Those families built an altar, decorated with a carpet and flowers, outside or inside their garage, and at each of those stations, the priest placed the monstrance on the altar and led prayers and a benediction before moving to the next house. The cathedral’s celebration is larger, having 10 stations. Some parishes carry on older traditions, where particular families, as their inherited intrega, “own” the tradition as a kind of right. They set up the station altars, and when they can’t do it any more, can pass on the right to other families who can receive it. 1. Personal interview, March 10, 2017. 2. 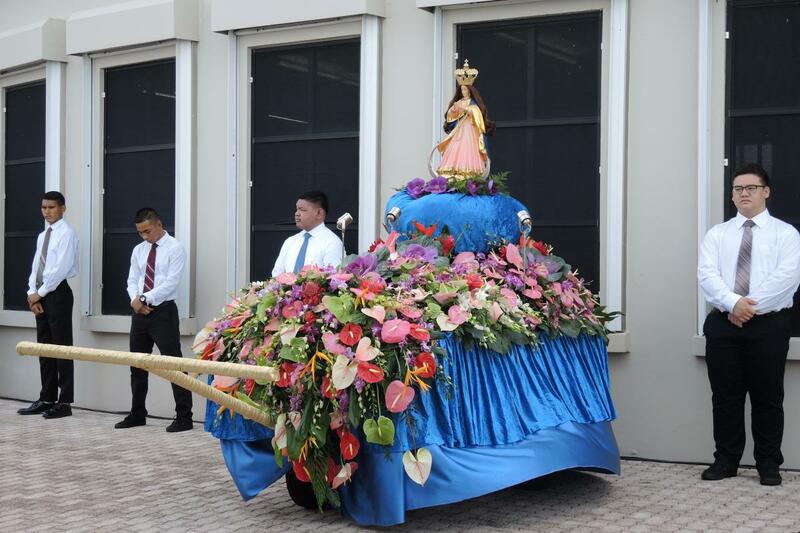 Examples on this site include Argentina’s Señor y Virgen del Milagro, Limache, Chile’s Virgin of the 40 Hours and Obando, Philippines’ Our Lady of Salambáo.